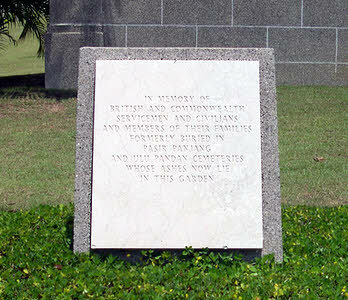 Following the withdrawal of British forces from Singapore in 1971, The Singapore Government moved military and military family burials from Pasir Panjang and Ulu Pandan Military Cemeteries to Kranji. This delicate work was carried out from 1975-1976. 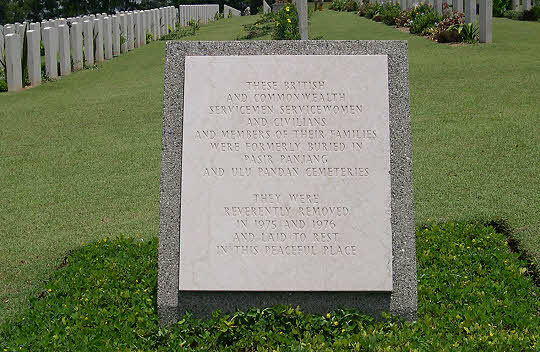 In later years burials from other cemeteries in Singapore were also moved to Kranji. These included Colonial Police burials. There are in excess of 4,200 burials in the Military Cemetery. ABOVE: A Memorial Stone in the Military Cemetery. The graves beyond are in the War Cemetery. The south of the Military Cemetery. The War Cemetery is beyond. Memorial to the burials exhumed from Pasir Panjang and Ulu Pandan which were cremated. 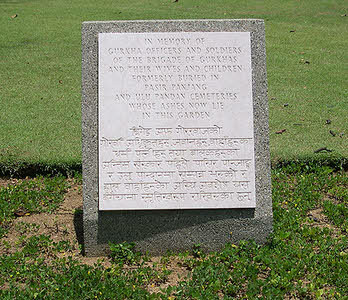 Memorial to Gurkha burials exhumed from Pasir Panjang and Ulu Pandan which were cremated. A Memorial Cross in the Military Cemetery. The cross can be seen centre right in the panorama of the south of the Military Cemetery above.